I couldn’t figure out an easy way to stream the audio directly, but here’s the audio file from 365 Days of Astronomy. Over the last decade or so, you may have noticed news items announcing a new galaxy observation that breaks the record for age and distance. 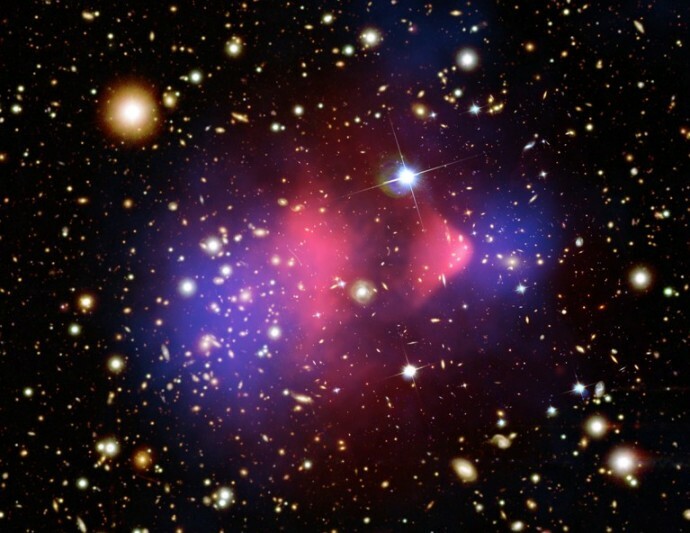 You may recall an exciting discovery that was made while studying a galaxy cluster known as the Bullet Cluster, showing the distribution of dark matter for the first time. Eleven exoplanets – planets orbiting other stars – have been found using a method that’s more suited to smaller planets than the standard techniques. These seemingly unrelated discoveries are connected by a concept known as gravitational lensing, a phenomenon in which gravity acts like a telescope, magnifying and creating images of distant objects, providing astronomers with a powerful tool with which to study the universe. Before we can understand gravitational lensing in detail, we need to grasp how gravity can affect light. As many of you know, general relativity replaced the old concept of force – influences extending through space as formulated by Isaac Newton – with a geometrical picture. To see how this works, imagine a smooth globe with the latitude lines and meridians marked. Two tiny travelers set out northwards from the equator at different longitudes; since their imaginary world is smooth, they can keep marching in straight lines until they reach the North Pole. In other words, they start off in parallel walking in straight lines, yet they both end up at exactly the same point. If you slice the globe along both of their trajectories, then connect their starting points by cutting along the equator, and lay the shape you get flat on a tabletop, you would end up with a triangle. (In practice this is most easily done with an orange, with its thick peel!) Two sides of this triangle are not actually straight, and the angles add up to more than 180º, unlike the triangles you studied in high school geometry. In fact, this view of the two travelers makes it look like they were attracted to each other by a force – but there was no force! Each traveler believed they were following a straight line, but because of the curvature of the globe on which they walked, the effect was exactly the same as if they were attracted to each other. The effect is the same; the cause is different. This is the essence of general relativity, though the geometry of many gravitational systems ends up being a lot more complicated than a sphere. Another consequence of this geometrical view is that light will also follow curved paths under the influence of gravity. The paths won’t be the same as those of massive objects like electrons or planets, but Einstein recognized that this effect would be a good test of his theory. The deflection of light by the Sun’s gravity was first measured by English astrophysicist Arthur Stanley Eddington, who led an observatory expedition to the African island of Principe in 1919. The challenge is that starlight isn’t nearly as bright as the Sun’s light, so to see how light from stars is deflected by the Sun required performing the observation during a total solar eclipse. He measured the apparent position of stars and compared them to their positions when the Sun is in a different part of the sky, and found the difference in apparent position to be in agreement with Einstein’s predictions. Later observations have continued to confirm Eddington’s results. 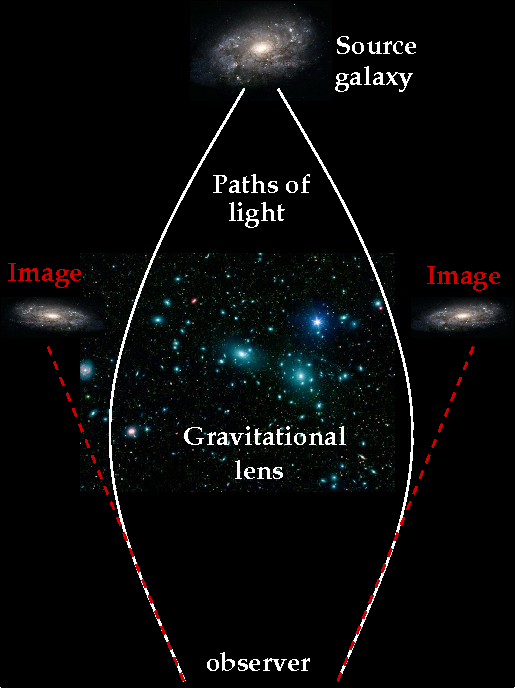 A simplified view of how lensing works: light travels from a distant galaxy (labeled as the source), but its path is affected by the gravity of the big galaxy cluster at the center of the image -- the gravitational lens. The two paths of light shown curve around the sides of the cluster, so we get two distorted images of the original galaxy. Now we can begin to see how gravitational lensing works: going back to our smooth globe, imagine placing a light source like a galaxy at the South Pole. The light rays will follow meridian lines as before, but this time place another galaxy at the equator, which we will call the lens galaxy. The light rays will pass on either side of this galaxy and begin to converge on the other side. If an observer with her telescope sits on a latitude line somewhere between the equator and the North Pole, she will see the source galaxy magnified because the light rays haven’t fully converged – they are slightly separated. In a normal lens like many of us have in eyeglasses, the path of light is bent due to the fact that the speed of light is slower inside glass or plastic than it is in air. This phenomenon is called refraction, so I’ll refer to the usual kind of lens as a refractive lens. By shaping the refractive lens, light can be focused (as in a magnifying glass) or slightly diverged (in the case of many of our corrective lenses), so the shape, size, and composition of a lens determines the manner in which light is bent. A gravitational lens works in a slightly different way. For one thing, light will generally be unable to pass through the lens – galaxies and stars are opaque, so the light often will be traveling around the lens. You can somewhat replicate this effect by putting a small circle of paper over the center of a refractive lens; you will still get an image, but it will tend to be distorted, especially if you are using a lens designed to correct for astigmatism in your eyes. You may also be able to see multiple images of the same object, depending on the lens shape and orientation; this can also occur with gravitational lenses. The image formed depends on: the distance between the source and the lens; the distance between the lens and the observer; whether the lens is directly between the source and the observer or not; the shape, size, and mass of the lens, which determine its gravitational influence; and of course the properties of the source itself. The most dramatic type of lensing occurs when the lens is very massive, such as a galaxy, a galactic nucleus, or a galaxy cluster. Called strong lensing, the images formed can be highly distorted, even to the point where an image can form a complete ring. Even if the alignment isn’t right to make a ring, a single source can sometimes be split into multiple thin images arranged around a circle. In fact, this is sometimes the way lensing is detected in an observation: if there are several very thin-looking galaxies that have identical light profiles, it’s a pretty good guess they are actually images of the same galaxy. 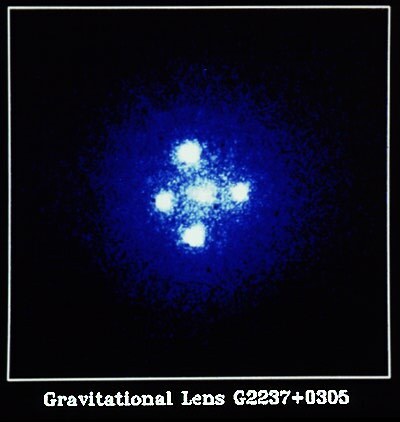 A particularly famous gravitational lens is known as the Einstein Cross; in this image, a bright galactic nucleus is split into four images arranged around the lens galaxy in – you guessed it – a cross shape. Whether or not the images are multiplied or strongly distorted, they can be magnified. The advantage of this is plain: a distant galaxy may be too faint to be seen even with a powerful telescope, but with a gravitational lens to boost and focus the light, it may yet be visible to us on Earth. In a press release dated April 12 of this year, it was announced that the Keck Observatory along with the Hubble and Spitzer space telescopes had observed a galaxy that formed 13.5 billion years ago – just 200 million years after the Big Bang. This is the earliest galaxy discovered to date, providing a lot of information about the earliest galaxies in our universe. Under ordinary circumstances, a galaxy that formed so long ago and so far away would be too faint to be seen. But what if the source isn’t a single object like a galaxy? The cosmic microwave background is radiation left over from when the universe became transparent, about 300,000 years after the Big Bang, and as its name suggests it serves as a background to everything. When this light passes a galaxy cluster, it will experience lensing, but since there’s nothing to image, what we see is a distortion of the background. This effect is called weak lensing, since it is far less dramatic than strong lensing. A great use of weak lensing was made in 2006, when studies of a galaxy cluster known as the Bullet Cluster showed it to be the result of two clusters colliding. The system was studied using X-ray light to get a map of the hot gas, and weak lensing was used to determine where most of the mass of the cluster is. The observation showed that the mass was almost entirely separated from the hot gas, providing an independent measure of where the dark matter is in the cluster. Finally, microlensing is the weakest kind of gravitational lensing. Consider what happens if one star passes between Earth and another, more distant star. 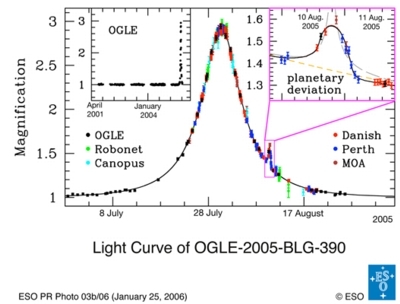 Since stars are compact, we won’t expect to get a big image, much less a multiple or distorted image; instead, there will be a temporary brightening of the source star’s light as the lens star passes in front of it. Obviously, this doesn’t happen all the time: stars aren’t that big compared to the vast emptiness of space surrounding them, but there are also a lot of stars, so we can get microlensing observations occasionally. Where this gets exciting is if the lens star has a planet orbiting it. In this instance, there will be a large magnification from the lens star, with a small boost when the exoplanet crosses in front of the source star. Using this method, scientists have found eleven exoplanets, including one only 5.5 times as massive as Earth – the smallest planet discovered until the Kepler mission began operations. Because Einstein’s general relativity is so mathematically challenging and mostly is needed only when gravity is strong, it is often considered impractical. Lensing shows this perception to be false; through lensing, general relativity becomes an essential tool for astronomers to study a wide range of phenomena, from exoplanets to galaxy clusters, from objects close to Earth to the most distant galaxies in the universe. In this account, I’ve made no attempt to be exhaustive – there are many systems I simply don’t have time to describe! Yet all these things are visible to us, when looking through gravity’s lens.